Bahamas Telecommunications Company launches the latest in a raft of new stores opening throughout the archipelago. The new outlet in George Town boasts interactive stations for downloads, games, music and data, as well as a range of other services. 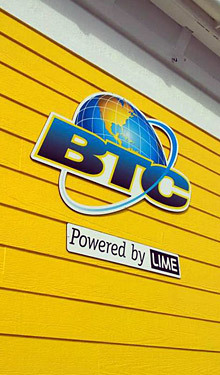 Bahamas Telecommunications Company (BTC) in George Town opened its doors today following a major two-month renovation that transformed the dated administrative offices into a 2,500 sq ft sophisticated, vibrant retail outlet, with a wide selection of devices and products not previously available in Exuma. The store includes interactive stations for downloads, games, music and data, as well as a range of other services. The George Town renovation is part of a pledge that the company made just under a year ago, promising to open 50 new or remodeled locations by the end of 2012. “We pledged a new retail footprint and we are pleased to be delivering on that promise,” says BTC chief executive officer Geoff Houston (pictured). According to Sophia Hart-Rolle, Exuma manager, the island is ready for the new look and feel. 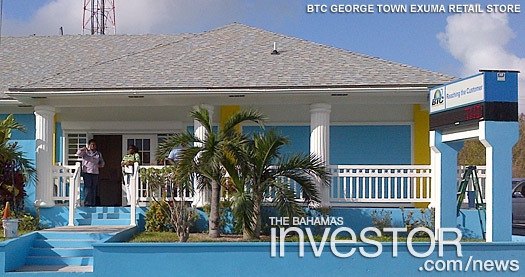 BTC is opening transformed stores in rapid-fire succession including: the flagship Mall at Marathon store in Nassau in December; Pioneers Way in Freeport, Grand Bahama, in January; and the Bay and George Streets locations in downtown Nassau in March, with Shirley Street opening April 23. Treasure Cay, Abaco is slated to open shortly, with four stores in Eleuthera under construction, and renovations at locations in Marsh Harbour, Abaco and Long Island are on the near horizon. New to the summer events line-up are Audition Star, Cartoon Network Studios Fantasy Camp, StoryTellers Scrapbooking Camp and Cheerleading Camp hosted by United States Cheerleading Association. Former television news anchor is responsible for public relations for the telecommunications company, as well as its corporate responsibility programme.